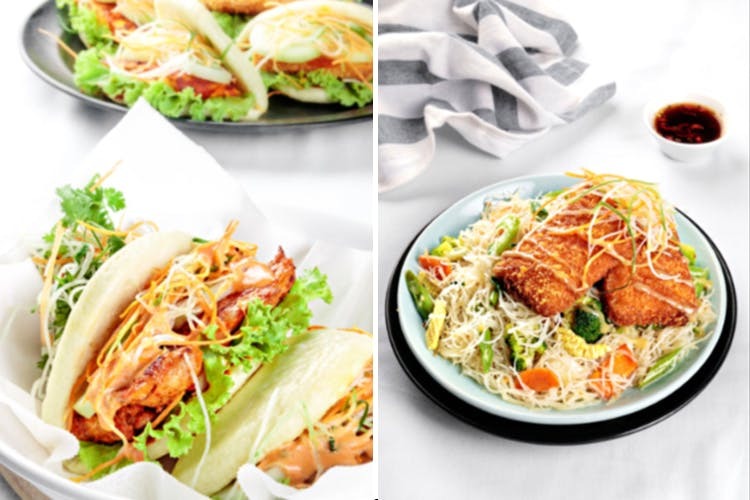 Asian delights with a customised menu, with budget-friendly choices, The Wok Shop is our new fave spot for a quick meal. The litchi and lime cooler. Customisable options and prices that let your feast like a king. A nook in the food hub of Koramangala, the minimalist yet grungy decor is a casual space for a quick lunch or snack time. Grey walls and wooden decor add a street-style edge, and the open kitchen space, around the seating area tempts with delicious aromas of the dishes. Since you can customise your meal, pick the base, from rice, noodle or udon and add sauces and protein to your selection. There’s the simple but flavourful garlic butter, pungent Hunan or the spicy Szechuan sauces, or even sambal for that earthy flavour. From the protein section, you can choose to add Thai grilled fish, crumb fried chicken or paneer for an extra punch. If you want to go down a healthy route, you also have the choice of adding tofu. My favourite combinations so far, are the rice with sambal and grilled Thai chilli fish; or the Udon noodles with black pepper and basil, with kung pao chicken. But here, you are the master chef so it’s time to get creative folks! From the bread department, go ahead and give your sandwich a twist. Try the baos where you can choose from afore mentioned fillings that are served in a soft bun. Oh, there’re also soup pots with a choice of carbs that come as thukpa, tom yum or in a homely Chinese-style. Don’t skip the dessert — the chocolate bao bun is a real treat with a rich chocolate filling just waiting to ooze out. We love this place because it’s tough to get bored of the food. And even if you do, that’s you fault! You’ve not been mixing and matching well! Call us if you need help next time!